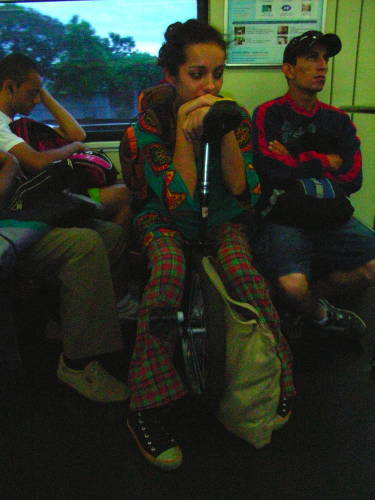 The first person I meet upon arrival at the Sao Paulo airport at the local bus stop is not what one would expect. 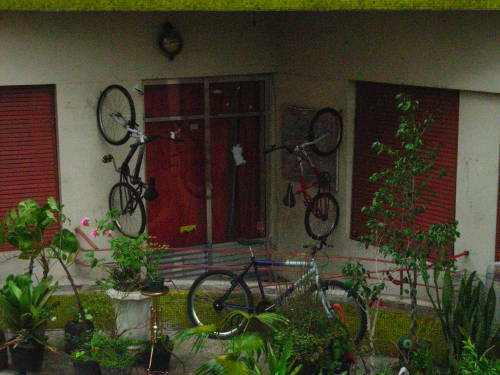 It is a one-wheel bicyclist with a big flower hanging out of her rucksack. We continue and take the metro together into the city center in the early morning while chatting about biking. 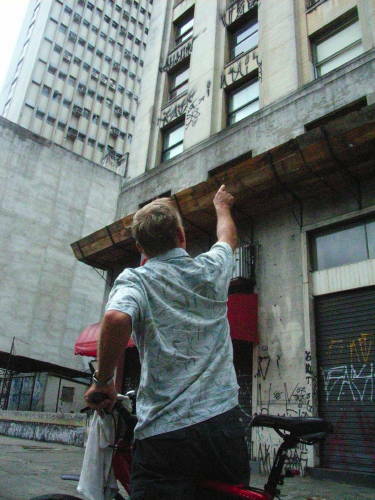 The horror stories about the criminal Sao Paulo seems not so dangerous anymore. Actually I start to feel at home remembering good times when I was last here in 1991 visiting APEDEMA and other environmental organisations (which you can read about in the blog post evnironmentalists and rubber tappers). 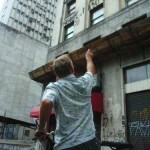 Sao Paulo is the only time were pick pocketers have tried to rob me but without success so I am a bit cautious. But the feeling is that this huge city with its almost 20 million inhabitants and the highest criminal rate in the world after Mexico City according to some sources this time will give me a safe welcome. 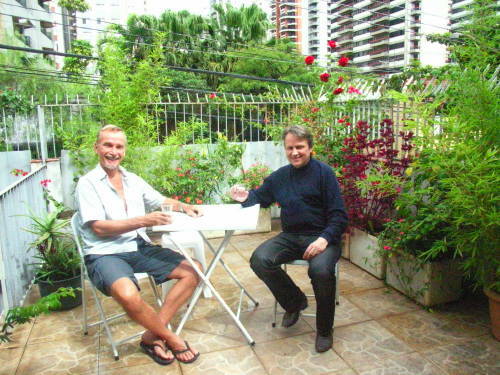 Finally I reach Perdizes where Pertti Simula, my Finnish host lives. 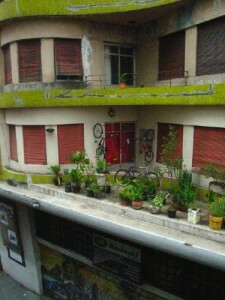 The hills are steep, the skyscrapers are high and on the slopes there is a small one story house high above the street and deep down below the skyscrapers with a wonderful small garden and a practical back yard were I get my own room. The weather is pleasant, the fruit is fresh, the computer I can borrow is a new Macintosh on which I can start my blog with the help of all the material i brought with me on a CD, skype connects me with the world. 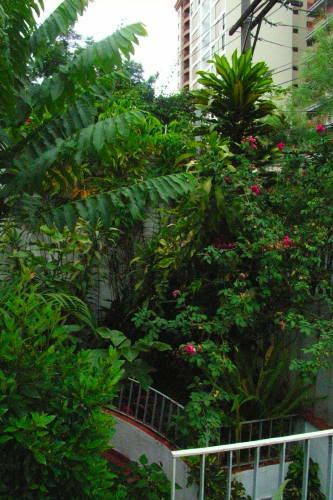 In short a small paradise in the middle of endless urban scape. A place to rest one would guess during the weekend, but than you do not know my host. 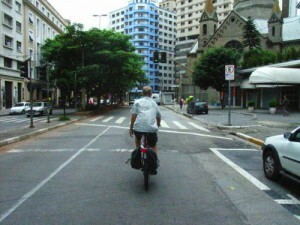 Pertti is the most dangerous bicyclist in Sao Paulo. 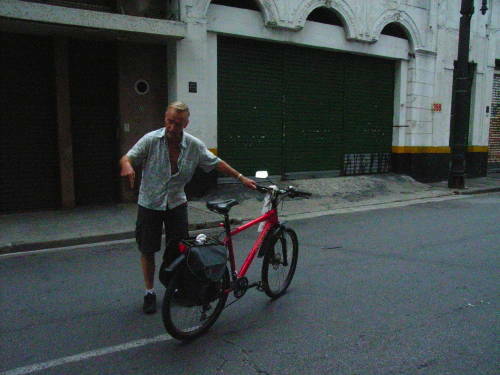 It does not take long time after he finds out that I once in my very young days as a 17 year old dreamer went cycling from Sweden to Sicily and back before we both have a bike and are supposed to have a nice weekend on two weels through Sao Paulo. Perttis sence of freedom is to run as fast as possible through the city center on bike. We start on the somewhat surrealistic motorway viaduct that runs though most parts of the city center in a narrow gap between steep skyscaper mountains. Under us are cars, on our sides are cars and nowhere is any parque, all is dense city. Once a week on sundays this motorway is closed for cars and people and bikers can stroll along as they like. I stop to make a photo of a balcony with plants and bikes all over, obvious some people tries to make the impossible, to live as it is possible to cycle and park a bike in this city. When we stop it does take a long time until we start talking with a man from the open minded Northern Brazil who praises the beaty of swedish women and talks with a soft voice about Ingrid Bergman. 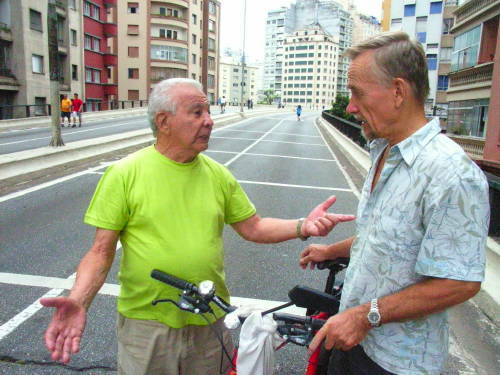 The tour goes on from the unrisky freedom on the car-free motorway to the risky freedom on narrow streets through the different parts of the city center. 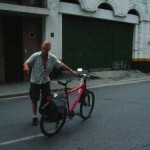 I do have some problems adjusting myself to the way Pertti cycles, most of the time on the wrong side of the street against the traffic instead of on the right hand side. I have some kind of spontanous hinderance against this kind of cycling but tries to follow the route cross pathways, through one-way streets in the wrong direction, up and down through the hilly Sao Paulo with holes in the streets and bumpy asphalt. I suddenly could use the old time experience from 40 years ago which had not been used since than in the way how to cross 8-lane circulation road around Colloseum in Rome and take short cuts through narrow steep lanes in Perugia. Unfortunatly I did not dear to take a photo while we were cycling against the traffic so here you get a photo when we do it the right way. In the old city center Pertti had come to work at the Finnish state owned Valmet tractor company in 1973. It was good time for the Finnish employees with the whole city center and its bars nearby. It was also in the time of the military dictatorship. One block away from the Valmet office building the security policd had their headquarters. Pertti heard noices from the street and went to the window to see what was going on. There he could see a man running and someone coming after him. He went immediatly down to the street and saw how the man trying to run away was shot dead. This upset Pertti, that a normally dressed man could do such a thing. Then it became clear that it was a security police in civilian clothes who had killed the man. Whether the killing was part of a planned way to murder the man by provocing him to flee thus enabling the police to kill him or if he actually had been trying to run away Pertti never found out. 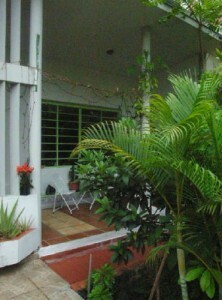 In the security poilice head quarters torture and systematic murder of political opposition was common in the 1970s. As a foreign citizen working in a corporation the risks were small although Perttis bosses tried to convince him to not get too much inolved when something happened. When the custom searched him on the way back from Finland once he had no choice. His luggage was full of Russian novels. This aroused great interest in the security minded custom. Finally it was clear how soviet communist came ino the country. Pertti demanded that a boss should come and solve him from the accusations. A boss arrived getting as aroused as his colleagues about so many Russian texts. Pertti demanded once more that a boss should come to sort things out, this time a boss of the boss. When this boss arrived he took the books, saw that it was Dostojevsky, Gogol, Gorkij and other Russian writers, stated that Pertti had a good tatse when reading such classical European litterature and gave them back to him allowing him into the country instead fo the security police head quarters. 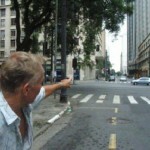 Finally we hit the main street in Sao Paulo, Avenida Paulista. Here tells me Pertti to be very careful. Even he do not dare to drive against the traffic here. Finally I find the rational reason for Perttis way of cycling. It is sometimes better to ride against the traffic (if you are not too many I guess) and see the vehicle than to have them coming from behind. 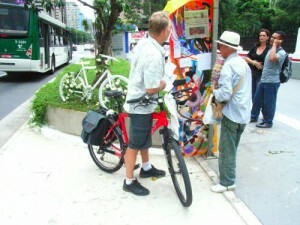 In the middle of Avenida Paulista is a stand on the pathway. People stop and read. The stand have a news article protected by plastic about a bicyclist that was killed on the spot one weak ago. 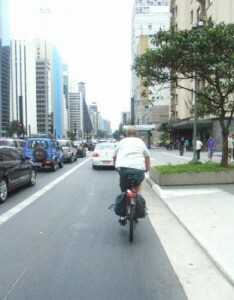 She was a bike activist struggling for bike paths in Sao Paulo. A bus had crashed this experienced bicyclist here on Avenida Paulista in the bus lane whish also cyclists are supposed to use. To commerate her a bike had been painted white and decorated with white flowers. 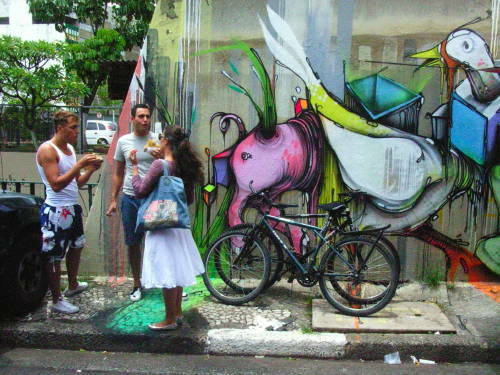 In spite of the dangers for bikers in Sao Paulo you find then all over the place, her at the market with a typical Sao Paulo urban graffitti. Who will win in the end one wonders, the car or as one can see on this grafitti coming from the bushes behind a fish on a bike.